That kind of mould is not healthy unfortunately. You can also ask a friend to give you a bit of their starter or ask for some in a bakery if you don't want to start a new one from scratch. bit I would remove the thin layer. As far as I am aware mould is rarely healthy and might not be good for your health! Someone more experienced than me will give you a more comprehensive and better opinio, but this is what I think. I think I'd start over and use nothing but wheat or rye flour for the starter. Whole meal of either one or a combination of both should keep this type of problem to a minimum. Save the additional seeds for the dough you'll build with a sound starter. How about the greenish mould that we eat in blue cheese? It is healthy. So it looks like some moulds are healthy. ... for mould to be growing. Sourdough isn't. Mouldy starter and mouldy bread are not good. It won't be OK. Throw it out. It's not growing on top. The mould is all through your starter; the layer on top is simply the part of the mould that you can see. You need to throw the whole thing out, and sanitize the container. Would the mould be due to the seeds in the flour? Ahh I thought those things were part of the mould. I'll have to find it but Debra Wink, our resident microbiologist (you might wish to bring this to her attention), has dealt with many questions on this subject. I've been having a look and at first I thought this reminded me of another case similar to yours but dismissed it because of, what I now know are, seeds. Take those out of the equation and it could be the reason this has happened was because of the low yeast population which normally keep this kind of growth at bay. Either that or it's bad mould and should be thrown away. 1: start a new one! But keep everything very clean and well away fro this one. 2: Find some fresh looking starter (if there is any) and toss the rest. Clean the jar well and give it a good feed. Keep warm at around 25°C and only feed again when it's bubbly. Re-feed a few times allowing it to peak each time. First feed may be done with pineapple juice. Try this to see what happens and out of curiosity and in the meantime you've started a new one. Avoid cross contamination. was that it was the oils in the seeds responsible for for the mold. What if you used just flour? I followed your advice and discarded the sourdough. I bleached the container and started a new culture with plain white flour. I keep the sourdough on a wood plank placed on a radiator. Following my previous post. I loosely cover the container with a silicon cover, loosely so that the air can circulate. I usually feed it once every 24h but I see that Abe wrote: 'only feed again when it's bubbly'. I'll try this. Do you culture other things? Do you make yogurt or kefir? Cheese? Beer? Kimchi? Do you use milk to feed the starter? It looks like a mold that grows on my kefir when it is neglected. Makes great cheese. I wouldn't worry too much about this mold killing you unless you inhale it deeply into your lungs. I'm not medical but we are always surrounded by mold and mold spores. Some molds are just more adaptable than others. I would wonder, though, if your sourdough pH gets acid enough to discourage these opportunistic growths. However, some molds love an acid pH. Try using just flour and water, wash hands well when handling (utensils,also), get a fresh bag of flour. See where this gets you. I also stir my starter and make sure to clean off the starter smeared on the jar sides with a clean paper towel and water so there is no extra food dried on and harboring spores. I make yoghurt. I used to make water kefir but I don't anymore. No milk to feed the sourdough, I feed it with flour and filtered water. 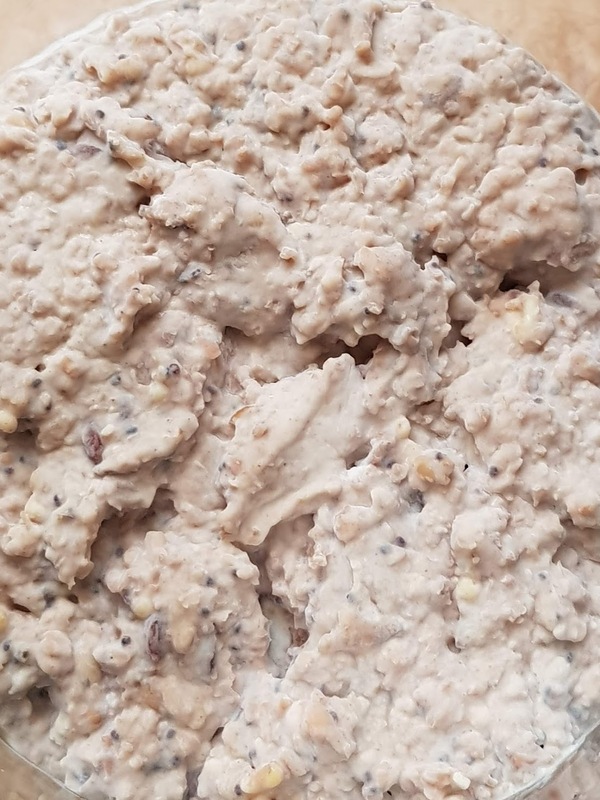 When I feed the sourdough, I transfer it into another container, mix it with flour and water, wash and dry the original container and re-transfer the mix into it. Cleaning the container each time and transferring actually raises the risk of introducing bacteria. Starter jars are "self cleaning" with proper maintenance. Add the water, use it to wash down the sides, then goes in the flour and mix. I see. I'll try this although I like a clean container and mixing new flour and water, even the way you write, will never let my container look so clean as it looks now. Who never change their starter jar and it's less than spotlessly "clean" (it is clean even if there may be bit's of starter clinging to the side after it rises - but that you can wash down when feeding) and never grow mould. You'll probably find more cases of mould with those who clean the jar every time. Unless it's done very well you can introduce some bacteria or even leave in some soap. Healthy starters keep mould at bay. ...most likely here because the starter itself hasn't been kept healthy? If that's the case then maybe it would make sense to treat it differently in the future. Of the maintenance. Too much swapping jars and cleaning them out. If it bacteria wasn't introduced then perhaps soap was that upset the starter. Other then that maintaining a good population of yeast and bacteria which should keep the PH level steady will help curb mould growth. Between dirt and bits of dried starter stuck to the side. You don't want to leave it there so washing down the sides with the water you are feeding it and then adding the flour will be adequate. Then you add the flour, it'll ferment, bubble up and become acidic taking care of anything else trying to populate it etc. It's not dirty per se. But cleaning the jar everytime, using soap and a sponge etc can introduce bad bacteria more so then having a good feeding procedure. Starters are a symbiotic culture of bacteria and yeast. It's living. The jar is it's home. Has a PH level that sustains this. You need to feed it and maintain levels of hygiene but swapping jars the whole time and using cleaning products with every feed is more upsetting to this perfect balance. I suspect the sponge with which I used to wash the jar. If one has to clean and swap the jar due to something like a starter volcanic eruption then sterilising is best. But if well maintained you should hardly ever have to wash the jar. Bet most people here have starters in jars they can't remember they last washed out. the bleach! If you feel the need to scrub, some household vinegar, a clean brush and a good rinse with lots of water should work. If you're trying to get rid of caked-up sick starter, do not send all that stuff down the kitchen drain. Let it dry, scrape off as much as you can onto paper towels or brown paper bags from the fruit and veg man, and toss it. You'll get there. Chin up and keep us posted. Heat is a good steriliser of containers. I would just clean in soapy water, rinse and pour boiling water in and let stand for a minute or two. The lid should also be sterilised by placing in a bowl and pouring boiling water on. Alternatively for most plastic containers you can fill with 1/2" of water, put lid on loosely (keep it cracked open with a toothpick or similar) and microwave for 2 minutes. The steam generated will have a great sterilising action. Skipping the bleach? Oh dear. Skipping the bleach? Oh dear... it's just what I used to sterilise my jar today. I'm not in luck. really, really well you should be OK. But bleach is supposed to kill everything, isn't it? I'm not sure I'd want to eat off a plate that had been bleached, but that's just me and my two cents. I'll shut up now. Sorry if I alarmed you. ...your mugs are not absorbing too much bleach, then your tea will be fine, and you won't have any problems there. But the point is you're not intentionally trying to grow special microbes in your tea mugs. If you were, you might act otherwise.